The Starship Enterprise crew also featured a very unique and most exotic individual, as being half “alien” (to earthlings, that is!) and half human, and the one that brought a feeling of mystery and fascination to the show. This was the quietly superhuman and cool genius known as ‘Mr. Spock.” With his heredity spiked with warm human foibles confusing his cold analytical Vulcan mind and disciplines, he was the most easily recognized of the Star Trek icons. 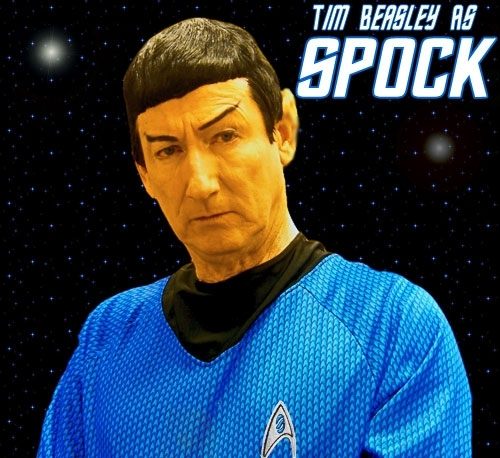 Tim Beasley is very happy to bring his “Spock” portrayal to life in the time warp back to our present 21 century. As the original 1960’s Star Trek programs will always be considered the best, “Spock” will also remain the favorite “First Officer” of the Star Fleet. Having your own “time warp” ahead to the Star Trek future? Let Tim as “Mr. Spock” be your emcee to “beam everyone up” to a fun time! Not only does Tim look the part, he acts it as well, with a remarkable voice impression and then adding the 4th dimensions of Spock’s mannerisms and personality. Bookings for trade shows, conventions, futurist theme events of all times, TV and radio spots, private parties, too, nationally!